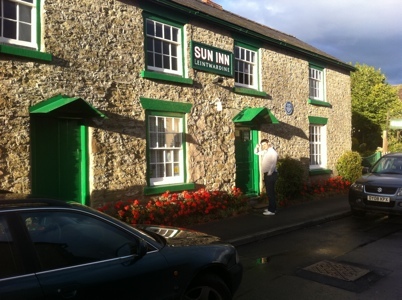 Visiting the Sun Inn in Herefordshire used to be like wandering into someone’s house and stopping by for drinks in their living room. Beers at this so-called ‘parlour pub’ were served from the kitchen: there was no bar counter and customers sat together, chatting at long wooden trestle tables. The interiors had changed little since the 1930s. The landlady at the heart of this historic establishment, Flossie Lane, was by all accounts a real character. Running the pub for an astonishing 74 years, she’d often fall asleep in a chair, rather than heading up to her bedroom – despite the best effort of regulars encouraging her to go upstairs to bed.Flossie was in her latter years but was said to have a good understanding as to all the goings on in the village of Leintwardine. 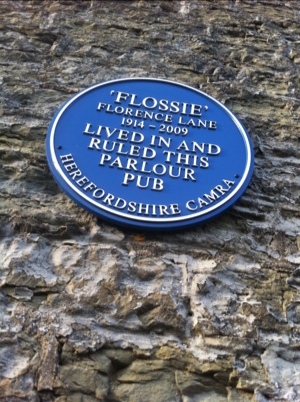 But when sadly Flossie died in 2009, aged 94 and reportedly Britain’s oldest landlady, the pub faced an uncertain future. National media were particularly interested in the story, given that the Sun Inn is one of the few remaing examples of a parlour pub. Who would take on such venture, where the only revenue stream came from serving two different beers? I first visited the Sun Inn shortly after the death of Flossie when it was run by local CAMRA (Campaign For Real Ale) volunteers. They did a good job of opening it as many evenings they could and maintained the system of serving drinks direct from barrels in the kitchen. Returning this month though I found that the pub had completely changed. 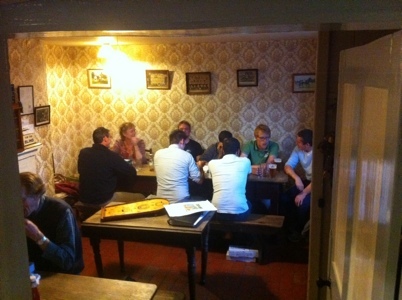 The original rooms with long tables at the front of the pub remained, but a large airy room the back had been added. One of my friend’s described the extension as a ‘National Trust cafe’ – it had nothing in keeping with the traditional parlour pub make-up at the front of the property. Beers, while of a high quality, were no longer served from the kitchen direct to tables but from a regular bar counter where punters queue up to place their order. In addition, wines, lagers, soft drinks and even espresso coffees. In the past coins had been simply been thrown into jam jars – now there is a till. The atmosphere had completely changed. Now owned in part by Hobsons brewery, bar staff said that trade was good and that the change had been required to make it a commercial venture. But in building the large extension a unique piece of Britain’s heritage has been destroyed. The busiest part of the pub on the night we visited was the new area at the back, taking the focus away from the front rooms where strangers would have sat next to each other and started conversations. I don’t blame the current landlords for the destruction of this unique piece of heritage – they are running it as a business and need to at the very least break even. Instead, I think it’s sad that as a society we failed to step in and save this parlour pub. Surely an organisation like English Heritage or the National Trust could have stepped in to keep it going as a working museum? It’s positive that Leintwardine has a local pub (at a time when other villages don’t), but the sun has well and truly set on an important part of British history. Hi Mark, I agree it is a shame the pub could not carry on the same, but that was very unlikely. Even the National Trust or whatever would have to meet new access/health and safety standards. They might also encourage too many tourists rather than drinkers through the door – it could be more of a museum than a pub. And personally I liked the ‘National Trust cafe’ style out the back, it has a relaxed feel, not trying to create a new over-imposing image which would stifle the retained parlour pub at the front. I hope you’ll agree with me and remove this post and any attached meta-tags immediately. I agree Mark, I think it now feels like two completely different pubs. I’m all for choice, but how long until someone takes it over, prefers the new bit and decides that the Flossie’s living room at the front is no longer needed?